I am playing again in the Twofer challenge - the current theme is STARS. For my first card I sprinkled black Brusho pigments onto water color card stock. I got a bunch of backgrounds out of this one and decided to go with this one. Since the white background from the water color paper looked kind of blah I sponged distress inks on top. I also outlined some of the bigger stars with a fine black pen. 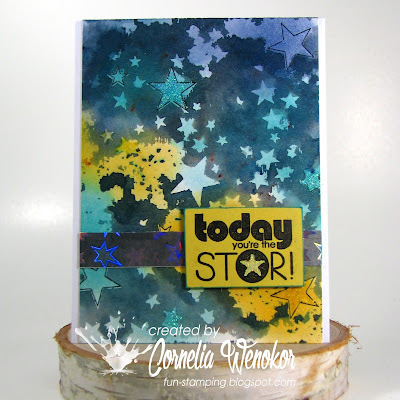 Added iridescent tape (with stars, too) and the sentiment (lil' Inkers). In teh end I also added some Stickles. For my second card I did the same thing. I used emerald and grey Brushos and used photo paper instead. Again I got a bunch of backgrounds out of this one. 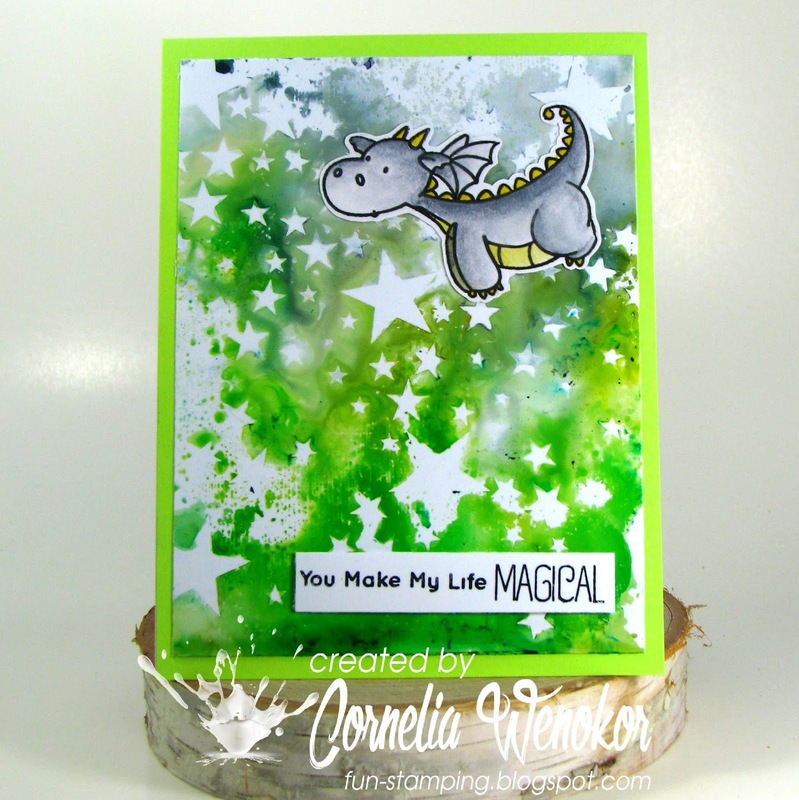 The cute dragon is from My Favorite Things, as is the sentiment. You're really johnny-on- the spoy with this Twofer...and what a twofer it is. These backgrounds are spectacular. Loving the vibrant colors on both...and that sweet little dragon fits right in. I know this word is overused, but -- WOW -- your starry backgrounds are fantastic! You're very good with the Brushos. 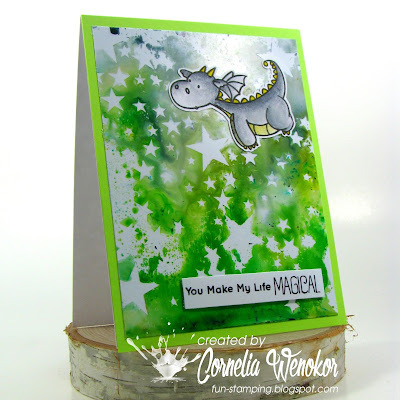 I especially love the green... maybe because it has that cute dragon on it, but I do have a thing for green. Thanks so much for sharing your twofer with us at Twofer! Wow! I love these..great star filled backgrounds. Both are magical, Cornelia. You've made wonderful star backgrounds with your Brushos. What beautiful star cards you created with your stencil and brushos Cornelia! love the colors and your sweet dragon! 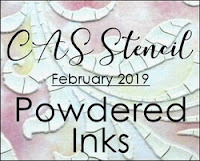 thanks for joining us in the CAS Stencil challenge! 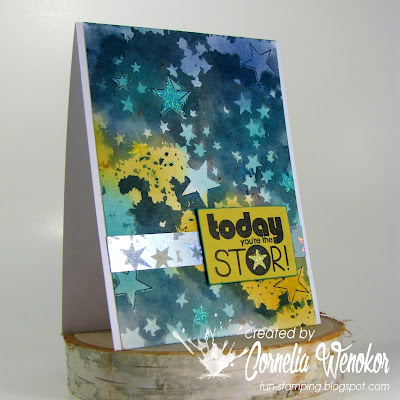 Fabulous stenciled Start cards Cornelia. The colors are so rich. 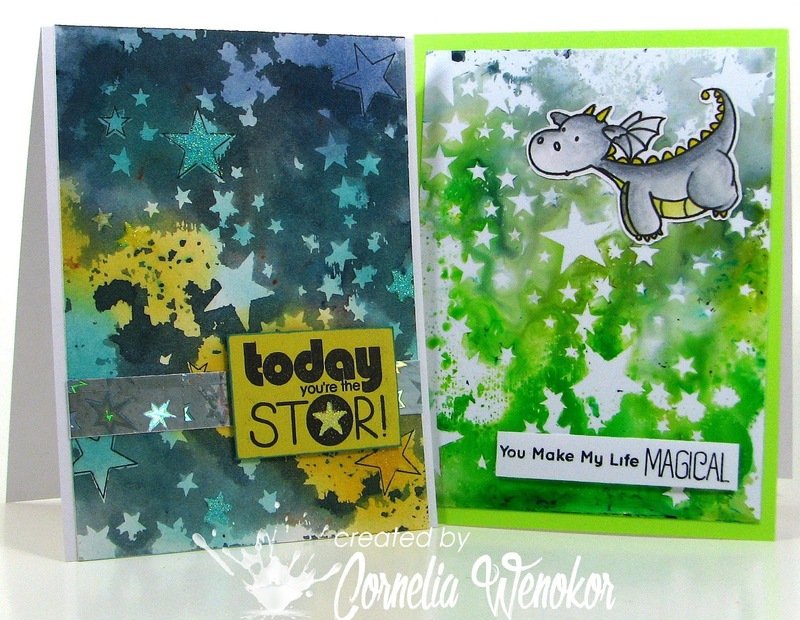 Beautiful galaxy backgrounds and fantastic cards Cornelia! 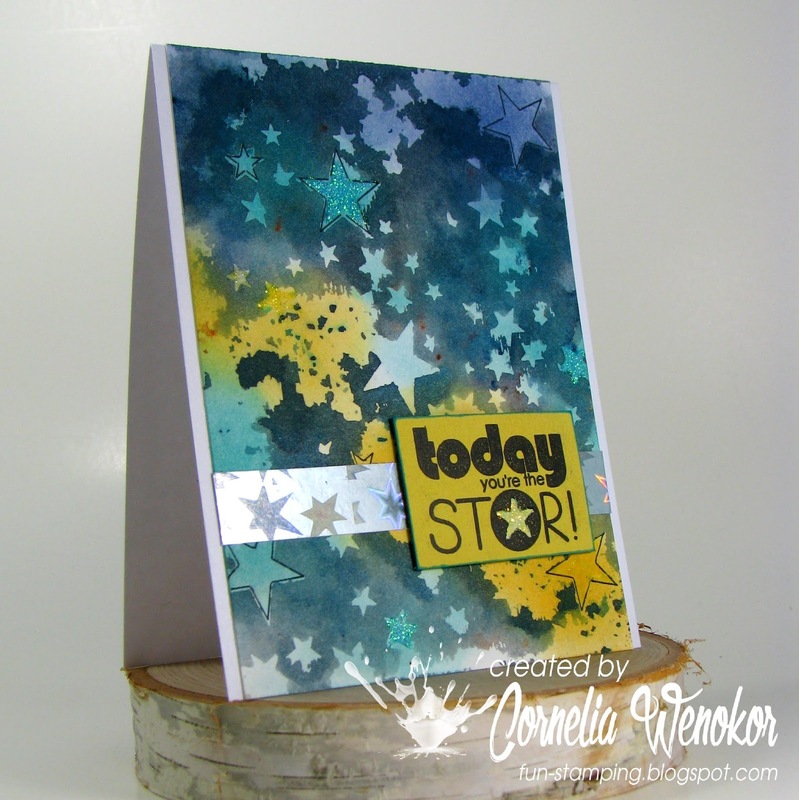 Thanks for playing along with us at Twofer Card Challenge and CAS Stencil. These are both gorgeous. I love the backgrounds.